It’s no secret that the majority of us are visual learners—a full two-thirds of the entire population, according to the Social Science Research Network. But are you taking full advantage of the opportunities to communicate in their language? Digital signage is making it possible to reach consumers through high-resolution displays deployed in a variety of ways for use in corporate boardrooms, retail environments, transportation hubs and more. The intelligent use of commercial display technology can grab attention and communicate information with a high degree of effectiveness. Considering that the human brain processes visual images 60,000 times faster than text, and can understand a visual scene in less than one tenth of a second, visual messaging is a crucial piece of any enterprise strategy. Today’s display screens can reduce the stress of daily activities and improve user experiences. 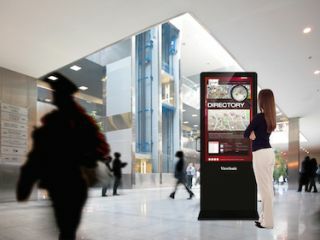 Users can swipe and stretch touch screens on digital kiosks placed in shopping areas to learn details about products available in a brick-and-mortar retail store, or engage with maps and directions to a train connection through an interactive kiosk. Advertising, presentations and emergency notification systems can rely on display walls and digital billboards to capture and captivate those wandering eyes with large-format, ultra-narrow bezel screens and vibrant colors and images. Learn how commercial displays can help you grow your business through impactful communications from industry leader ViewSonic. Get an introduction to challenges many businesses face and how commercial display technology can help solve them, with solutions ranging from digital billboards and large-format video walls to all-in-one digital kiosks. More than a billion people get their weather forecasts and information from AccuWeather. Learn how AccuWeather uses ViewSonic display technology for its interactive StoryTeller in 14 of its top 15 markets. Dive deeper into digital display technologies in this white paper on Solstice visual collaboration solutions and discover the benefits and methods of bringing true collaboration to your clients.